Well, another busy weekend has come and gone! And my, what a busy weekend it was. Things began as planned. Weretoad and I headed to Syracuse after work to attend a vigil for incoming grovies. Only…that didn’t happen. One of our beloved members had a medical emergency. We did some healing work before parting ways, uncertain whether or not there would be a ritual the next day. The vigil, alas, has been postponed until further notice. But these things happen and everyone was very understanding. In fact, we were all really worried about our grovie. Muin Mound is a family and the shock of what happened was palpable. We spent the night with family in Utica – arguably a shorter drive for us. The next day came and we didn’t know what was going on until mid afternoon. Hubby and I drove back to Syracuse for our Midsummer rite. Everyone wanted to be together and send more healing energy to our friend. The deities of the occasion were Airmid and Miach, two healer deities. To postpone honoring such Gods during our crisis would have been a missed opportunity! The altar was set and we gathered. I’ve been really absent minded recently. 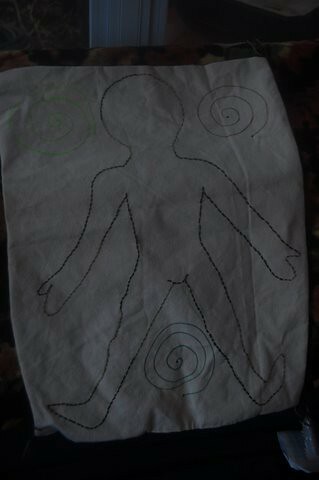 I volunteered to make Airmid’s mantle for the rite. Everyone was to bring herbs to place upon it. Well, I made the mantle (as pictured above in its wrinkled glory), and brought some herbs, but I forgot to research them! I use them in cooking and magic but I didn’t know their healing properties off the top of my head. I felt really foolish, especially as the point was to bring back the old knowledge, but I’ve had so much to keep track of recently that I’m amazed I even made the mantle! Everyone seemed to really like it although I wasn’t entirely pleased. It’s my first real attempt at embroidery so I guess it’s good for a beginner! It wasn’t burned as I thought it would be – rather the herbs were placed in the field (some were toxic to burn) and the mantle will be used again. I’m very proud of that, actually. I love that I’m contributing to the grove. I should write about the process for the Artisan Guild study program! Other highlights of the evening included: Brian singing a lovely invocation to Airmid; a new person visited and didn’t seem frightened off; amazing strawberry dishes at potluck which gave me a foodgasm; and our sick member made an appearance, reassuring us that she would be okay! I pray that she continues to recover and comes back stronger than before! I left feeling rejuvenated. 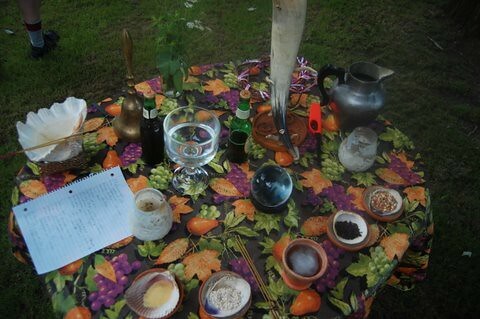 I have felt so spiritually stifled this month that a ritual with fellow Druids was exactly what I needed. I also feel resolved to study up on herbalism. I have a real interest in it but I’ve only dappled here and there. Naughty Druid!